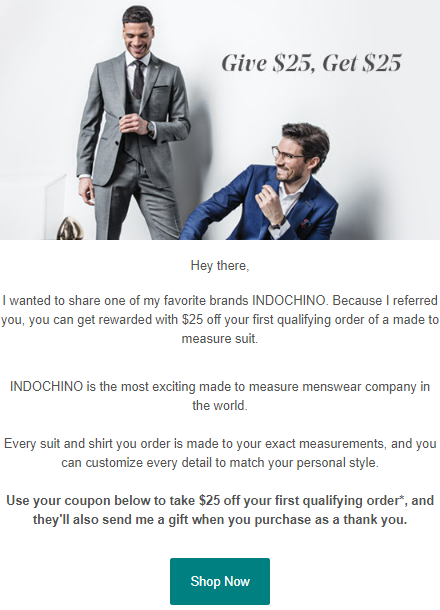 Indochino offers designer custom suits, shirts, chinos, blazers, and overcoats. They are highly customizable with hundreds of fabrics and personalization options, including lapels, pockets, buttons, linings, and monograms. These custom clothing options are then made according to measurements provided and shipped to your home. 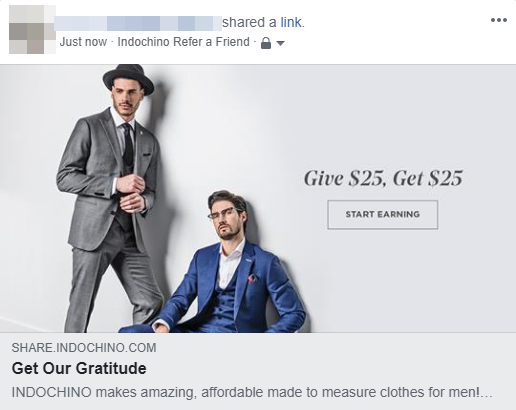 While this program does offer double-sided rewards, the amount of the reward compared to the cost of a made to measure suit is quite negligible. We enjoy the personable and branded messages offered through the program, but the program itself was not very easy to find. Participants receive a $25 credit once the referral uses their own $25 credit towards a made to measure suit purchase.